← How to convert a document of mht to eps file in a command line? How time files!I am glad that meet everyone again,I really want to know how about you?And how about your status of learning the Advanced PDF Tools. 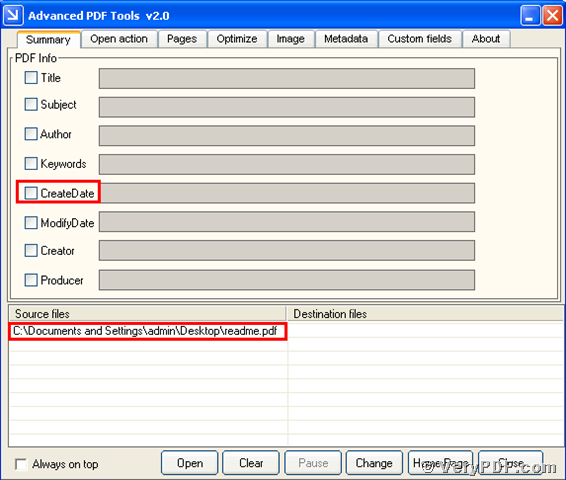 If you have any questions about this software you can contact me or you can consult this website http://www.verypdf.com/pdfinfoeditor/index.html, because this software Advanced PDF Tools are produced by them.Anyway,Let’s go to our today is topic:“How to edit pdf creation date? ”According to the routine,I will explain the method through the image and words. Because I think use this way it can directly show for my every reader.If you are my funs,so just give me some suggestions that how to let every learners to easily learn the Advanced PDF Tools.Because my destination about writing themes is spreading significant skills to everyone who need to use it in their daily life, not only just jump up my words and do not make sense.I strongly support to write themes that tell people something,or make people to master a kind of skill that they can apply for it in their offices. Let to go the straight,first come into this website http://www.verypdf.com/pdfinfoeditor/index.html, and download ,install the Advanced PDF Tools.You’d better to save this software in the desktop in order to find it quickly.Second,let this software run,then drag your pdf file to this software and make sure your pdf file enter into this procedure.Please look at the vertical boxes,you will find the fifth box with the title“Create Data”That’s what we need to edit pdf creation date for our pdf files.For example,your pdf file name is “readme.pdf”.You will see image A.
Third,put your mouse into the icon of the new produced pdf file.And click the right-hand key,select the “properties”you will see the horizontal menu,click the button“PDF” ,you will see you had change the creation data to “11/2/2011”.I hope you can master how to edit pdf file creation date by using the Advanced PDF Tools.You see this software is powerful and easy to learn ,if you want to purchase it.You can go to this website http://www.verypdf.com/pdfinfoeditor/index.html and have it. 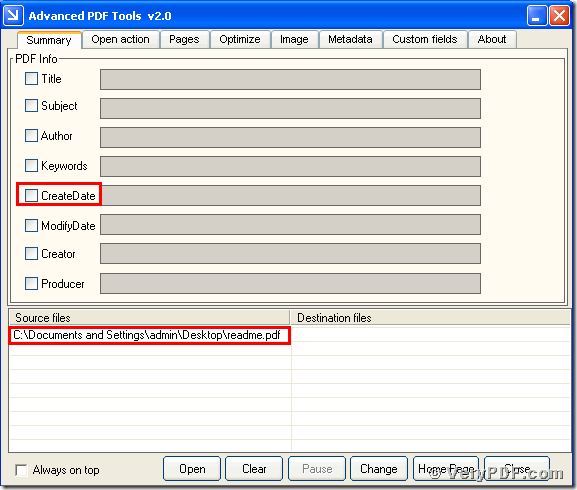 How to edit Metadata of PDF File with C#? 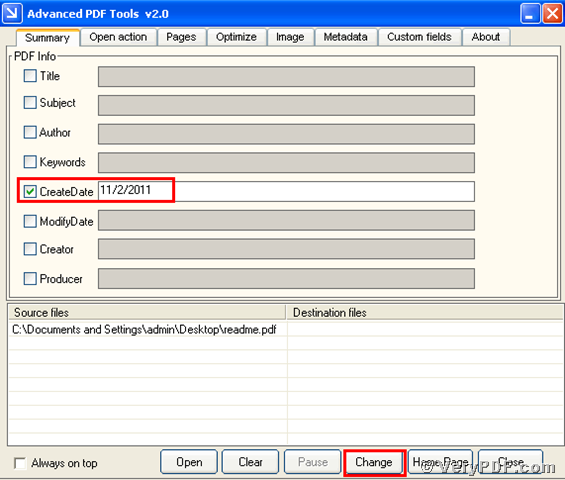 One Response to How to edit pdf creation date by using the Advanced PDF Tools? I just purchased the advanced pdf tools 2.0 and when I try to change the creation date/or any date using the checkbox and then click change -- the date does not change. This is a regular pdf file with no security. 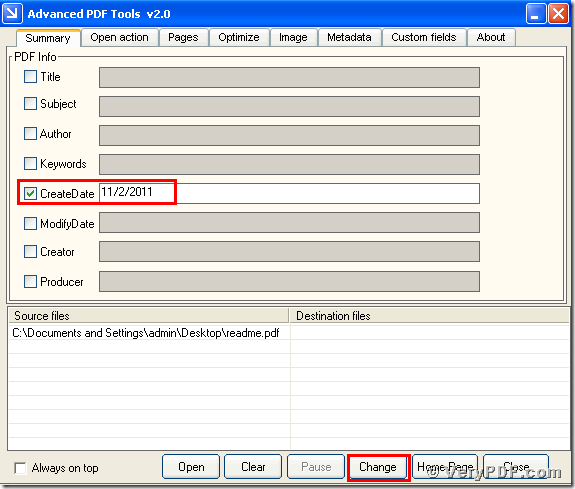 What do I need to do to change the date of the pdf file?